The actor: Frances Fisher started in theater, made the jump to daytime drama in the late ’70s with a recurring role on The Edge Of Night, then expanded into big-screen work a few years later, where she has earned acclaim for performances in such films as Unforgiven and The Lincoln Lawyer even as she was getting cut out of others, including Big and Waiting For Guffman. Fisher’s largest-grossing performance, however, remains her turn as Kate Winslet’s mother in Titanic, now on Blu-ray. The A.V. Club: What was your familiarity with the story of the Titanic going in? 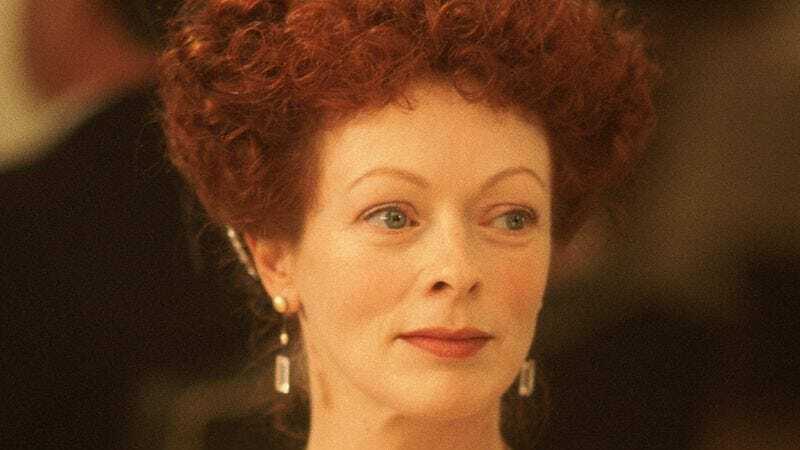 Frances Fisher: Well, I had read about it, obviously, in school, and knew a little bit about it. And I’d seen A Night To Remember a number of times, because I loved it so much. So I probably had a little bit of understanding about Titanic. But then, of course, I got all the research books when I got the role so I could understand a little bit about what was happening politically and socially in that era. AVC: How was the audition process with James Cameron? Was it at all daunting? FF: It wasn’t, actually. I was very excited about it, because I just knew this character in my bones. And I’ve got to say that it was one of the easiest characters I’ve ever played, because all I had to do once I got the part and was on set was—my hairdresser would put my hair up and I’d put the wardrobe on, and I was Ruth. It was a transformation that came from the outside in. After doing all the research, of course, and understanding the emotional life of the character. But Jim loves actors, and he was a fabulous director to work with. AVC: Did you have a similarly enjoyable experience with your onscreen daughter? FF: Oh, Kate [Winslet] is lovely. We met before the film and bonded a little bit, and when we were in Mexico, we had a great time. We had dinner together and we’d just hang out, so we could get to know each other as people. So when we were on set, it was just very easy to play that role. But, you know, it’s easy to play a mother if you’re a mother and it’s easy to play a daughter if you’re a daughter, and we both had that going for us, so… [Laughs.] But she’s lovely. And we’re still good friends. AVC: Was it surreal to watch Titanic turn from a film into a phenomenon? FF: It was pretty trippy, yeah. I mean, for 15 weeks in a row it was No. 1, and that was quite a phenomenon. It was quite amazing. That’ll never happen again. And it was wonderful to see how the audiences embraced the film and how moved they were by it. Because not only was it sort of an action film, but it was a beautiful love story. Before it was something we’d only really read about in history books, but the film really made the story of the Titanic real. FF: [Laughs.] Oh my God. Well, that was back in the late ’70s, when we shot soap operas from beginning to end. We didn’t go set by set. So it was a fantastic experience, because we would all go to the set at 2:30 and watch each other’s scenes as the camera moved around the stage, helping each other with our scenes. It was a really great experience for me as a young actor and a lot of fun. We were truly a family, both cast and crew. And I really enjoyed playing that character because I got to do so many wacky things. AVC: So did working on a soap opera help you prepare for working with Henry Jaglom in any way? FF: Oh my God, that was a whole other thing. [Laughs.] That was my first foray into improvisational filmmaking, which was great, and I’ve done several other films with Henry since then. I just did The M Word, about menopause, which was totally improvised. And that was a great experience, too, because Henry gives you so much freedom to create a character and come up with her in your own mind, then he sets the situation and you just go. FF: That hasn’t come out yet [as of this interview], but that was so much fun, too, because I was playing the head, but we did it all in British accents, because the conceit is that most British comedies come over here and the Americans re-do them, like The Office. So Rob Corddry had the idea that this was an American TV show that the British picked up and copied. I had a blast doing that, and I had a blast wearing the crazy wig I wore, along with all of the paraphernalia. Rob Corddry is so much fun. I just adore him. FF: Well, Michael Chiklis is a longtime friend of mine. Our daughters grew up together… and they’re both in college now! [Mock sob.] The thing that was fun about doing The Shield… working with Jay Karnes was fabulous, but what they do is, they don’t do the standard wide shot, reset for the two-shot, reset for the close-up. They have two fantastic steadycam operators who just grab shots. You never know whether you’re in a close-up or a two-shot or a wide shot, so you’re on your game all the time. And it’s fantastic to be actors on the show, because there’s no downtime, no saying, “Oh, I’ve got to go back to my trailer for 20 minutes and get ready for my close-up,” and getting all nervous and going, “Oh, now I’m close, now I’ve really got to do it,” and all that. You just do it every time. So the energy on the set was fantastic. FF: Well, that was an epic experience for me, because we were out in the middle of Calgary, where you could look 360 degrees and not see anything else around you. It was like we were back in time. The sets were so amazing. Every detail was taken care of. It was just wonderful. FF: [Sighs.] Oh, yeah. You know, I auditioned for that, and they wanted me to play a New Jersey housewife, and I did. But then when I showed up on the set, Penny Marshall looked at me and said, “You’re not the person we cast!” I’m like, “Yeah, I came in and did it!” So we shot all the scenes, but I knew in my heart that Penny was not going to be happy with the character because she wanted a completely different type. I don’t know what it was, but we had to shoot the scenes anyway, and it was very painful knowing that they were never going to be in the movie. But hey, I got to meet Tom Hanks and become friends with him, and Penny… you know, I love her so much. She’s got such an interesting sensibility when it comes to moviemaking. So it was unfortunate that I was cut out, but I’ve been cut out of other things, too. FF: Oh my God, Christopher Titus, what a talented guy he is. And of course I loved working with Stacy Keach. Stacy can do anything. Talk about being a great tragic actor and also a great comedic actor. In fact, I did Finishing The Picture with him a few years ago, which was Arthur Miller’s last play, where he and I play lovers, and he was just a consummate, fabulous actor. Just fabulous. FF: Oh boy, that was fun. That was a lot of fun. I remember going in and auditioning, and the director and the producer just stopped at the end and said, “Wow. Wow.” [Laughs.] I was like, “Okay!” I loved the twist at the end. I loved it because nobody saw it coming. In fact, I was talking to the director, and I said, “Maybe we should lay in a couple more little hints to the audience that maybe this character might be the one, so it doesn’t so come out of the blue.” So we did a little bit of that. We laid in just a few more little moments so that, when you go back and watch the film, you can track Mary Windsor’s character a little bit more and see that she was the force behind what was happening. FF: Oh lord. That film was gone in 60 seconds, wasn’t it? [Laughs.] Well, I’d worked with Bob Duvall before in The Stars Fell On Henrietta, so playing his wife was great. But that was a shoot where I didn’t feel satisfied with the role, because they were supposed to write me another scene to add a little bit more meat to the bone, and that never happened. So I was disappointed in that. But I got to meet Angie [Jolie], and we’re friends, so nothing is for naught. There’s always something good that comes out of every experience, and meeting Angie and becoming friends with her was a great bonus. FF: Oh God, that show had such potential, and it’s unfortunate that they pulled the plug on it. I just loved the format of Strange Luck, because every episode was a completely different one from the one before. And I liked being the go-to girl for D.B. Sweeney, because he always comes to me to get a cup of coffee. It was also nice to only have one costume. I had that little waitress uniform, so I didn’t have to worry about costume fittings and such. That was fun. I’m sorry that it didn’t go further. FF: That was my first real Hollywood movie. How wonderful it was to sit on a set with Norman Mailer and get to know him. You know, I had done so much theater up to that point, and learning the different technical aspects of shooting a film, the wide shots, the two-shots, the close-ups and all that… it was such a learning experience. That was a trip, learning how to pace oneself throughout the day, keeping the energy going on while spending so much time waiting on the lighting kits to be set up, then coming back and revving yourself up for that moment. As opposed to, like I said earlier, The Shield, where you’re just on the whole time and anything goes and you just keep going. FF: Working with Jamie Foxx, [Peter Berg] just set the cameras… he had three cameras going at the same time, and he just gave us a stage to play on, and we just kept rolling film, rolling film. We never stopped to touch up makeup or anything. We just kept on filming. And it was so fast, because he just kept the cameras rolling. He was just able to edit out any moments he didn’t want. It was a lovely experience. FF: That was a painful experience, to know that I was cut out of that one, too, because Rob Reiner called me up after we finished filming and said, “You know, you’ve got the funniest line in the whole film.” I said, “Oh, thank you so much!” If you see the deleted scenes, you’ll see what I’m talking about. But that was a disappointment, too, because that was another attempt to be in a comedy where people could know I was funny. I mean, it was just so, so disappointing. FF: That was always a dream of mine, ever since I did a set of head shots where—this photographer, after I’d done this straight head shot, he decided to play a bit, use some makeup on me, put my hair up. And Desmond Child, who was in my acting class at the time but has gone on to be a fabulous producer and musician, he saw the pictures and said, “You know, you look like a young Lucille Ball!” I said, “Really?” So I started doing research on Lucy and fell in love with her history and who she was. Not just what she did in I Love Lucy and everything she accomplished with Desi Arnaz, but just her life growing up. I thought, “Someday I’m going to play that part.” And sure enough, when I saw the casting call in Variety, I went back to that photographer 10 years later, I went out and got a couple of thrift-store dresses, hired a makeup person, and sent in my headshot as Lucille Ball. And I was the first one to audition, and after a long couple or three tours of auditioning Lucys all over the planet, they finally decided to give me the role. FF: That was quite the experience. I remember going in to audition for Paul Schrader, and we were waiting for Bill Forsythe to show up… and he never did! So I sat there in character for an hour. Just sitting there staring, because I figured I wouldn’t be a chatty person. Yolanda was a very serious, radical person, so I just sat there for an hour with Paul in the room. And Paul sat there, too. And we just sat there and stared. [Laughs.] And it was before cell phones, so there was no texting going on. I just sat there and waited. I think I got the job just based on sitting there and staying in character and not trying to get the job. The experience of making the film was amazing as well. They took all of us up to San Francisco for two weeks and put us into an apartment—like a safe house, with all the windows blocked out—and we all lived together. We slept on sleeping bags, we joked around, we put Natasha [Richardson] in the closet for a couple of hours. We all bonded. We became the SLA. We got to know each other as people and all that, and I think that really helped with the energy on set and the performances.